Seems like this week began with a Chinese-theme starting off with the roast duck noodle soup we had for dinner yesterday and then a quick Chinese meal at our nearby cheap and cheerful Chinese restaurant – Golden Sun. We were off to do our weekly shop at the English Butcher in the same strip mall and decided to stop by and have lunch upstairs first. 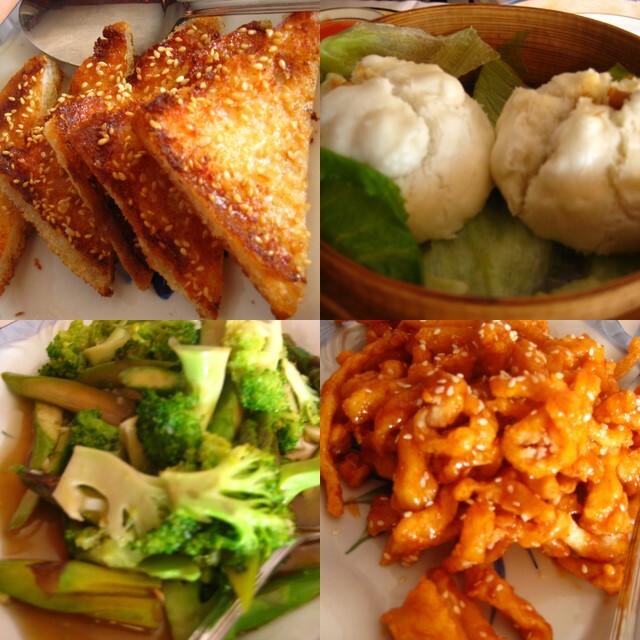 We ordered – char siu pao (roast pork buns), sesame prawn toast, crispy chili chicken (we normally have crispy chili beef), stir-fried broccoli and asparagus and egg fried rice. The prices are reasonable, the service quick and efficient and the food pretty good. Everytime I read your blog I get very very hungry.